A dungeon adventure for 2nd-level characters. The crown of the kobold king will be anointed in blood. Five children from the town of Falcon’s Hollow have gone missing, dragged off into ruins underneath a cursed dwarven monastery. Soon they will be sacrificed to the crown, all to the glory of the twisted King of the Kobolds. If they are to be saved from this gruesome fate, brave heroes must follow their trail to the monastery and plumb the depths of its trap-laden and monster-infested halls. This dungeon adventure, compatible with the world’s most popular fantasy roleplaying game, includes details on the town of Falcon’s Hollow and the deadly dungeons underneath a nearby ruined monastery. There are terrible dangers waiting for your players in the halls of the king, but they must be overcome if the player characters are to save the children. This adventure can also be run as a sequel to GameMastery Module D0: Hollow’s Last Hope. Written by fan-favorite author Nicolas Logue, Module D1 will be the backdrop for a huge, three-dimensional "delve" event premiering at Origins 2007. This module was my introduction to Nicholas Logue's work. The adventure outline has a lot of cool content and there are designer notes about why things are the way they are in the adventure. The encounters can be insanely dangerous. That's a design feature of Golarion and adventures written for that setting. The town of Falcon's Hollow is well-detailed and is a nasty, downbeat place. It's grim, but I feel that motivated player characters could make a difference and make it a better place. A very good well aged starting adventure, everything in moderation, with room for player buffoonery and game master experimentation. We had lots of fun with it, even though I had to park the random encounter manticore on top of the exit to keep the players from running away. Looking forward to try out the other two correlated D modules. There were only two minor issues. 1) There is no picture of Jeva as a girl, so good luck making that miniature. 2) The three bosses of the dungeon (Forge Spurned, Kobold King and Jekkajak) were all overpowering for my 2 member party, so we ended up watering down their weapons and spells. Great adventure. The quest to rescue the chidren was interesting as was the info on Falcon's Hollow and some of it's residents. Fun touches like the drunken hill giant, the encounter with Jeva, and the intro story about the kobold make this one of my favorite adventures. First, and most importantly, my players had a blast playing this adventure and I had fun DMing it. 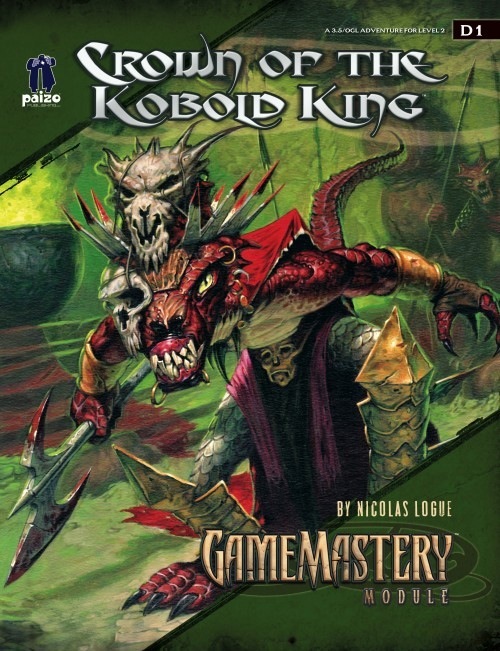 Second, the story of the Kobold King Merlokrep that serves as the introduction of this adventure is some of the best and most entertaining writing that I have read in all of the paizo modules. Fourth, the town of Falcon's Hollow, an ideal base for low-level campaigns, is detailed within. This section also describes Falcon's Hollow most important organizations and NPCs, including Thuldrin Kreed, who is possibly the most universally hated villain in the paizo modules line. All that to say that this is definitely one of the best modules that paizo has ever released. this was really fun. even though it took a little longer to get through than i expected, it was well worth it. the traps were pretty scary, and i thought there would be a tpk a few times. the story was really fun. lots of RP opportunities. Just read this today after picking it up at Origins. What an excellent adventure all round. A beautiful integration of well-designed challenges and thoughtful storytelling. I am particularly happy with the flavour of the unique magic items throughout. Lots of stuff that is so much cooler than a +1 sword. I'll definitely tie this to D0 when I run it. Someone suggested having the kids be motivated by the heroism of the PCs in Hollow's Last Hope to set things rolling in D1. Beautiful idea that I will completely steal. Yes, but does it have 'Diamond D'? Thanks Scribe!!! Coming from you that's high praise my man! Glad you enjoyed it! Hope it works out great for your group! Slay a man with your rapier for me Craig! But does it have "Diamond D"? I just recieved my physical copy of D1, and may i just say that the quality is excellent. I had already perused through my pdf file of it, and thoroughly enjoyed the adventure, having it actually in my hands has made it so much more appealing. It almost made me want to throw away my printer. Applause and congratulations to you Nicholas Logue for a great adventure, and thanks to Paizo for an excellent product. I bought the adventure the other day at a FLGS, and while I really liked the flavorful magic items, they seemed a bit overpowered/expensive (even with their drawbacks) for an adventure that takes a characters from 2nd to 4-5th level. Have you compared it with the wealth suggested in the DMG? That would answer your question as to if it is too much. Thanks Grimwolf! Glad you dig on the Koboldy Madness! Tim Hitchcock and I are working on a loose sequel (well a connected module at least anyway) called "Carnival of Tears." More danger and daring do around Falcon's Hollow if you are interested. Seriously though, you could ramp em back a bit with ease by removing one or two of the minor abilities they have, and that's not a horrible idea if you are worried about balance in your home game. Don't get me wrong, I loved the magic items in the adventure. The draw backs from using Droskar's Grasp and the Heartripper Blade mitigated my concerns with those items. However, I was more concerned with the Crown, which is a major boon with no drawbacks, as well as the king's +1 human bane battle axe. 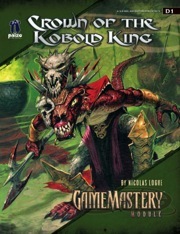 All together, the Kobold King (whose name escapes me) has nearly 20,000gp in gear, for a 7th level character! 1) It's a small axe. I have images of Belkar with this axe, but I'd sell it were I the PCs and you can't sell it in the town. 2) The crown is kind of grusome and will attract attention, as a DM I can run with that. True that. In retrospect after running the delve, that human bane axe is horrifically deadly. I think if you wanted to make it a +2 battle axe instead, that might save the party some tragedy. I suggest swapping out the Crown of the Kobold King and replacing it with the Crown of the Burger King. What are the stats on that crown? Face permanently frozen in a horrific grin? I too just got my copy of D1 and I am completely floored by the quality of the product. The full color maps and illustrations are fantastic. The adventure is great and has some dark overtones (especially in the section about what happens after the adventure is over) which I found to be a refreshing twist to the standard adventure. The NPCs are vivid as are the new magical items. I am glad I subscribed. I don't want to miss a single one of these. If the crown and axe give you pains, you could make the axe evil and intelligent "Feed me the humans!" It could yell "Kill the humans! Flay their skins from their bodies! Reeve their flesh!" at the top of its voice anytime humans are within 20 ft.
As for the crown, it could have a negative effect on the player's CHA based skills since the small kobold style crown would look pretty silly on the head of a medium sized PC. It could also be infested with some sort of kobold lice or just start to fall apart due to shoddy kobold construction and faulty magical enchanting. Thanks, ASEO! I know you're not easy to please so your compliment means a lot. Thanks ASEO! I am very excited about the many adventures coming out next! I've seen Gallery of Evil in manuscript form and it's especially tasty! D1 arrived in the mail today.... awesome! The production quality is through the roof. I have to say, this is the most visually attractive module I've ever owned. I know Logue is one of the best designers out there, so I'm sure I'll enjoy reading through the adventure this weekend, but I had to take a minute and just compliment Paizo on the work and effort put into this project! Very, very pleased. I sincerely can't wait to see Pathfinder. I'm a busy guy with two jobs and a family, and as a testimony to the quality of this module, I read through the whole thing quickly. I honestly don't know what to say. I can readily state that this is truly the first "complete" module that I have ever purchased, and I have purchased hundreds since the 80s. It wasn't enough to have creative encounters and a solid path through the module, but the level of detail of the town and its inhabitants is perfect. Not only was there a specific goal that could be achieved, but there was also pages of data to assist the DM to continue the adventure afterward with minimal effort. The ideas are all in there, and I honestly didn't expect that even after reading through the excellent D0. You guys have to keep this up. I promise, if you do, I will buy every module you produce even if I can't use them intact. If you don't have a formula of what should belong to the product line, you should take this module, extrude all of its components, and build one to use as a checklist of what should exist in every new module product you produce. Don't skip anything! As good as it is, it can't have been a fluke. Paizo has really given me new hope for what I thought would have been a significant low in the all time historical chart for RPG gaming since inception. Absolutely awesome! One of the best parts of this adventure is at the end: campaign seeds revolving around the future of the children; very sinister, quite believable, and CoC-style fatalistic (in at least a couple cases). I love it when I can end an adventure, the players are all high-fiving and happy, then I can drop a small bomb, and that happy collection of smiles turns into a collective wide-eyed stare followed by a silent, mouthed "Oh, s+&@!" and a sag of shoulders as they contemplate whether ot not they actually won and saved the day. There's something very viscerally poignant when the pathos of a story that is supposedly relatively happy actually ends sour, maybe unbeknownst to the characters, but bitter and sour, nonetheless. A little disturbing, but if you like the endings to movies like Fallen or Se7en, then you know what I mean. D1 is a very, very great start to the GM modules line. I combined all 3 of the final items properties into the headgear and made it evil because of the bane property. Made it a minor artifact and viola! no more money problem. Any self respecting party would destroy that thing. I got a local church interested and gave the party a level appropriate amount of the sell value of all three items in credit for potions, healing, wands, and miscellaneous items with the church for destroying it. Perhaps there will be a future adventure D? "The Forsaken Tunnel"? E1: Carnival of Tears could easily pick up where Crown leaves off. It is set in Falcon's Hollow and there are many potential links between Carnival, Crown and Hollow's Last Hope. I noticed, while reading through the adventure, that no stat blocks were included for any familiars. Is this going to be standard procedure for GameMastery modules? Except in very unusual circumstances (when the familiar is more of a combat pet than a familiar) we won't provide stat blocks for familiars. I'd rather have the space filled with more adventure anyway. Maybe you could include a line for the familiar under possessions that included hit points, AC (not broken down), and saves. Picked this one up just this weekend and for such a short module i'm amazed at its depth. finally a module that makes finding a secret door more worthwhile than a pile of coins. I'm hoping that when i run this for my group it will give them a dose of "reality" so to speak, as most of the rewards will have greater consequences than simply "i an buy that suit of armour now." What really set this one in my favourites was the very real feeling that the Falcons hollow isnt just another town on a map, it has true horrors in its daily life and personifies the harshness of the frontier. rescuing the kids will also set up the chance for my PC's to make some serious moral and personal choices in character, and will help to profile their alignments accordingly, as most are still hard to read. ever since the dungeon/dragon fiasco I was hoping that Paizo would continue in providing quality product. So far I'm satisfied and cant wait until the Rise of the Runelords gets released here in Australia! Wow! Thanks for the great review Dalorend! Hope you dig on Pathfinder too! #1 is amazing! A Jacobs Instant Classic! Australia eh? I am seriously toying with the idea of hitting the Gencon down under next year! Never been to Australia! Need a traveling buddy, buddy? I know the Pathfinder books have adventures, and I assume the Gamemastery Modules do as well. So what is the advantage of getting both, other than having more adventures to run? The Gamemasery adventures look nice, but I am on a tight budget so I am not sure if they would be worth it for me. actually (have to check up its location this year) but mostly its held in Canberra last i heard. on topic question. is there anyone who has already run this module, or is part way through running it, as I am about to start this tomorrow in a one on one session. so are their any tricky bits i should look out for? advice on the High EL encounters for low level PCs? where in the pathfinder setting is falcon's hollow located? Jason says that if Sandpoint were in England, Falcon's Hollow would be in Greece. So roughly 1500 miles south east. I like the module, but I have to wonder why no one buried the people at the orphanage when enough people knew that it had burned that children went to play in the ruins. Any ideas? Perhaps it's like the movie Stand By Me—all the kids know, but haven't told anyone else yet? The Crown is my favorite product so far from the new Pathfinder line. It has a cool story, a flexible layout and memorable characters. Keep up the good work! Have any of you guys read the part entitled "Return of the Children" ? I think it is a really cool idea to include this. However, and this may be just me, but is there a sad note about most of the stories? Any way, there are a few adventure ideas hidden in each. Nice. I have a request: Will Paizo be putting out a PDF like the Dungeon supplements that have the maps for D0 & D1 without labels on the maps? I'm running both of the adventures set in NE Karrnath in an Eberron horror campaign, and I was struck by the title of the adventure "Hollow's Last Hope," and named the town "Hope's Hollow." Any chance for unlabelled maps, or are they already out there and I'm just not seeing them? The Paizo folks have mentioned elsewhere that they would like to have untagged maps for download. Unfortunately, right now they are a little behind on the Pathfinder and GameMastery modules schedules. Once they are caught up (and not having to work 60+ hour days) they are planning on looking into doing the untagged map downloads. JJ has mentioned that he wants to come up with a different system than the one for Dungeon (they are still catching up on those), but he hasn't come up with anything yet. Keep your eye on the blog, I'm sure they'll make a big deal about it when it becomes available. pg 11 has that great blood-soaked journal page. While the author doesn't identify himself, he does name his traveling companions: Kemmrick and Martren. It appears they were taken by the forge spurned. If anyone is looking for another hook, you could always have one of these two be a PC's friend, who invited them to investigate Droskar's Crag and/or Darkmoon Vale. Maybe Nick has some suggestions as well? Or maybe some more background on this doomed party of adventurers? In the description of the forge spurned, it states: When a forge spurned’s chain is destroyed the souls bound within are released at long last. This is a great way to introduce some side adventures. The bound souls may be released, but that doesn't mean they disperse. In addition to Kemmrick and Martren, who knows what other souls are stored within the forge spurned's chain! This is indeed an awesome hook. The party of adventurers of which one's journal is found by his headless corpse may be a great way to add another personal hook to the adventure for a player. Maybe, they were part of this adventuring party before hooking up with the rest of the PCs, or their brother or friend was. That'd work nicely. As to what happens when the forgespurned chain is broken - that's up to the purview of the DM. I imagined that the souls sped to a blissful rest in whatever afterlife awaited them, and could be resurrected or raised thereafter if they were agreeable to it. But, if you want the souls to hang around there is great possibility for hooks to further adventures: An old dwarven soul from long ago who tales a tale of woe that befell his people and now the ruins of his home are cursed, but great treasures rest there for the those bold enough to seize them. Or a wizard betrayed by his twin brother who left him down in the dark (fodder for the forgespurned) so he could return pose as the wizard and marry his beloved. The possibilities are endless. Maybe the Whispering Tyrant snags some of these souls before they depart? This would be really cool, esp if one of the PCs died and the party returns later to do battle against "what lies beneath." You just made my day Varl! Thanks!